The gossip on MoC. Lists and polls are STRONGLY discouraged. ...yet another title I'm not *entirely* sure couldn't have been released under the MoC imprint. (I know this delineation doesn't actually matter, and I don't even really like the film this time around, but will look forward to the full details). mfunk9786 wrote: Glad to see Cure getting a Blu release, maybe a Criterion is on the way! It's been on their streaming services forever (or at least it was on Hulu for a long time). And of course, Marty is in Kino hell over here. As someone noted over at Blu-ray.com, it'll be interesting to see what they do about the aspect ratio. Perhaps they will offer different options, like they did for Shane, though that ended up spilling onto a second disc (and was Limited Edition; still one of my favourite MoC editions). And yes, Cure is a brilliant surprise! I was wondering if more Kiyoshi Kurosawa would arrive on Blu-ray soon after Arrow's brilliant Pulse release, but figured MoC were more interested in his contemporary efforts (especially as they're probably both easier to sign, and be in better shape transfer-wise). So I'm very happy to be able to finally get this through MoC of all labels. I found a copy of David Kalat's book on J-horror in Oxfam last year, and this film was obviously mentioned a lot, so I'm looking forward to seeing it for the first time. And whilst we're talking J-horror, my favourite to date would have to be Takashi Shimizu's Ju-on: The Grudge, which I noticed was one of the 'most wanted' titles in this Arrow's 2017 poll, so I'm hoping they'll deliver that eventually (maybe even with its sequel, and/or the previous TV movies). Many of these films were the kind of thing Tartan used to put out on DVD and I'd find somewhere down the line rummaging through the bargain section of Blockbuster, so it's great to finally see the best of them given an HD upgrade, plentiful extras and a decent bit of literature from labels like Arrow, Eureka and Third Window. Let's hope it continues despite the competitive nature of the market, and I'd love to see some Korean stuff from the same era show up (I notice 88 Films are starting to dig into that particular niche). Ribs wrote: ...yet another title I'm not *entirely* sure couldn't have been released under the MoC imprint. (I know this delineation doesn't actually matter, and I don't even really like the film this time around, but will look forward to the full details). Why not? They've released three other K. Kurosawa titles under MoC so far, one of which was notably a 'genre' film. Maybe I used a double negative which confused the meaning, but I meant why the one Best Picture winning title is not 'worthy' of the MoC imrpint. With Criterion hinting at Bull Durham, sigh, I'm thrilled that MoC will give us a Cure. Bluray. Thanks MoC. Ribs wrote: Maybe I used a double negative which confused the meaning, but I meant why the one Best Picture winning title is not 'worthy' of the MoC imrpint. Ah sorry yeah, no idea why they've opted for Eureka Classics on that one...unless that's a typo. I guess we'll find out tomorrow. Then again, I thought both Fleischer titles would be perfectly acceptable as MoC, and some people even argued for The Party or Rapture to be 'recognised'. Who knows how they make these decisions? Does anyone have a clue what could be announced on Thursday? Nope. Though the last few Eureka Classics titles have been things Kino Lorber released in recent years - Marty, The Party, The Vikings - so some of those might be something to consider. We'll find out tomorrow though anyway (or earlier if Amazon spoil the surprise). I've read they might announce De Broca's King of Hearts, but I'm now unsure if it would be in the Classics line or the MoC series. tenia wrote: I've read they might announce De Broca's King of Hearts, but I'm now unsure if it would be in the Classics line or the MoC series. I think they already mentioned it was MoC when they soft-announced it, but I just realised it's actually being theatrically released in June, so the announcement is likely for their new acquisition Allure (starring Evan Rachel Wood). Stanley Kramer's Inherit the Wind and Tom Gries' Heartbreak Pass. Do you think Eureka could release Judgment at Nuremberg too? Its a shame that Blake Edwards and Richard Fleischer got shafted by being relegated to Eureka Classics, but Stanley Kramer being denied a MoC spine makes it all worthwhile. To add to the complications surrounding what constitutes Eureka Classics and MoC, a listing for Yuen Woo-ping's Iron Monkey has just appeared on Amazon and is set for June. Great news obviously, but curiously it's saying Eureka Classics - making it the first example of a director having films under both the Eureka Classics and MoC banners, as well as the first foreign language title from Eureka Classics (though that's a bit of a grey area, as some foreign language titles from Eureka have just been banner-less). I'm confused: which Yuen Woo-ping film was released as an MoC disc? Thanks, for some reason I totally missed that one. That's a very packed list that would have trumped the US releases that did not even offer the film with its original score or language. Looking forward to this! 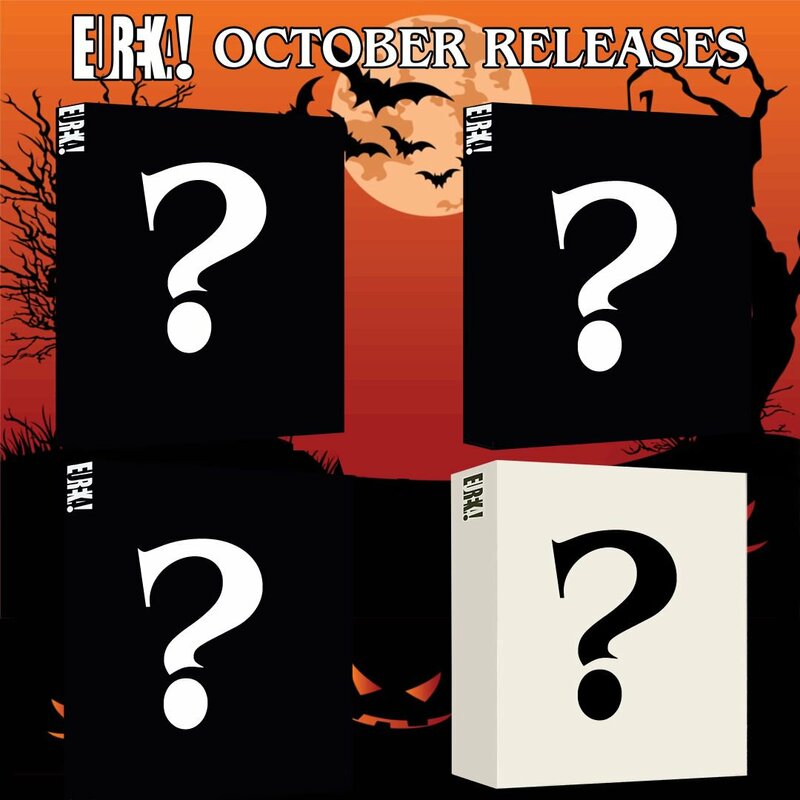 In less than 24 hrs we'll be revealing full deets of our four Oct 2018 releases... and we're all set for HALLOWEEN, with 3 of the 4 titles set to be HORROR. So join us at 3pm UK time tomorrow, for more info! What horror titles would you like to see get a Blu-ray upgrade? My guesses for the three horror titles would be Vampyr, A Chinese Ghost Story, Hush...Hush, Sweet Charlotte and Kwaidan. Fingers crossed we get one or two of those! All are Eurka Classics, no MoC. Yup, quite disappointing (other than the non-horror title). Still, confirms Eureka are still inclined to license from Sony so we could see some good things appearing for MoC. Seems even Indicator have a few blind spots! I love Project A so I'm over the moon with it coming from Eureka. Nothing at all from the MoC line this October so they must have a big title or titles for November. More Sternberg or Page of Madness would be most welcome. Last edited by Finch on Wed Aug 01, 2018 4:01 pm, edited 1 time in total.